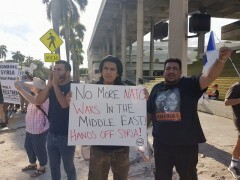 South Florida activists protest U.S attack on Syria | Fight Back! 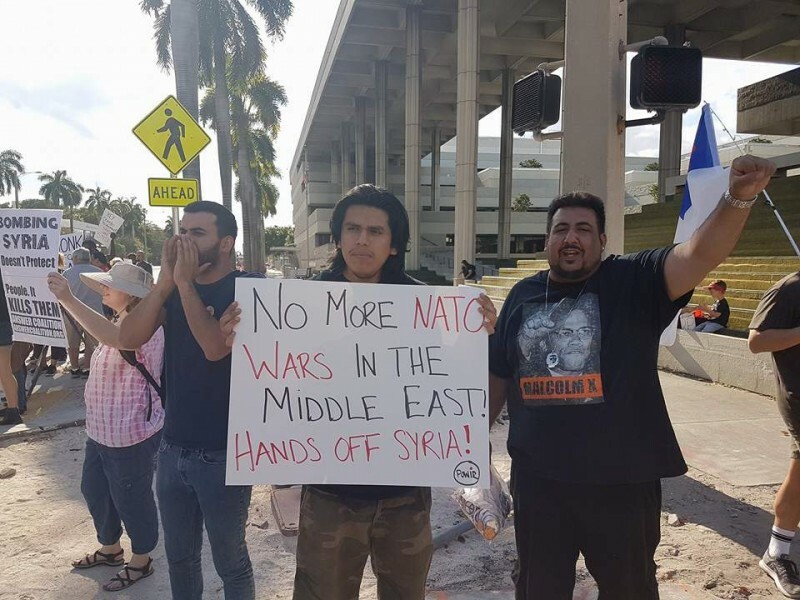 The group lined up along Broward Boulevard and shouted chants such as, “Hey, hey USA, how many kids did you kill today?” Protesters held signs such as, “Fund our school, not your wars,” and stood behind a large banner that read, “Stop the endless war! U.S out of the Middle East!” The spirited crowd was met with honks and fists in the air by people driving and walking by. The event ended with a lineup of speakers from anti-war organizations, including a very powerful speech from Ahmad Hamada who spoke of his life in Syria before moving to the U.S. Hamada told the crowd about how his friends and family have been victimized and killed by so-called ‘rebel’ Islamist groups over the last five years, and he pleaded with the U.S to stop arming and funding these groups and to stop the war on Syria. Before leaving, the protesters agreed to continue organizing against U.S. wars in the Middle East and throughout the world, promising to return to the streets should the U.S. continue to escalate. The event was organized by People’s Opposition to War, Imperialism, and Racism (POWIR).